In what could prove to be a decisive match for Tottenham’s title hopes, the match between Manchester City and Tottenham was very interesting indeed, with numerous tactical nouances and and uncertain outcome. Mancini left out De Jong, playing Barry and Milner in the middle instead, with Agüero just behind Dzeko, who also got the nod. Spurs went with what seemed to be an attacking lineup, but it proved otherwise. With both teams wary of the other’s potential, the first few minutes were a bit of a standoff. Both Barry and Milner lack Yaya Touré’s attacking drive in the final third, which meant that it was up to Silva and Agüero to try and stir things up offensively. However, despite their manager’s claims otherwise, Spurs were tactically aware and went for a conservative 4x1x4x1 approach, with van der Vaart side by side with Modric (they would eventually change sides), Parker patrolling the space in front of his defense and Defoe a bit stranded up front. 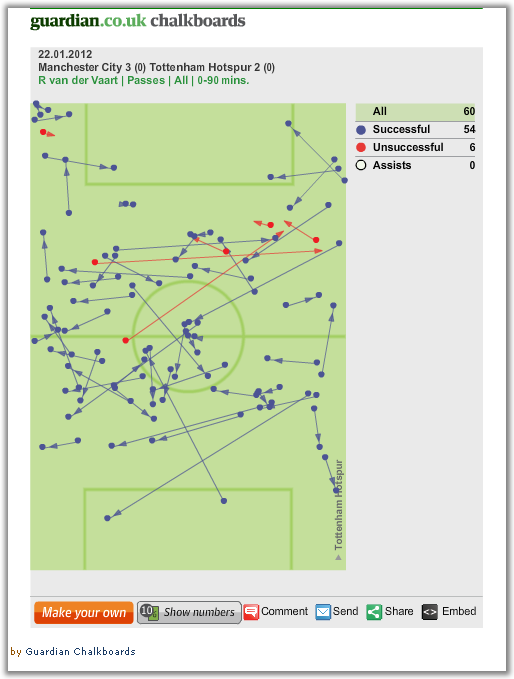 The chart below shows van der Vaart's limited influence throughout the match. This meant that Modric got Barry and van der Vaart got Milner and both pairs ended up cancelling each other out of the game. The problem for Spurs came when Silva or Nasri pulled inside (Silva was the key orchestrator, as always), the wingbacks were not willing to track them down, meaning Parker had to chase them, which in turn freed Agüero. As for the Londoners’ offense, Adebayor’s absence was key. Even though Defoe has improved his link-up play and here tried his best to challenge Savic (a strategy what would pay off for their first goal), he just didn’t provide the presence Spurs needed to hold up the ball and allow the rest of the team to join, which made the team lose the ball more and more quickly. The second half brought a more dynamic approach from City. Even though Barry and Milner continued to stay put, the wingbacks started to push forward and, most importantly, Silva and Nasri were much more active. Their movement, together with Dzeki’s, were essential for City’s first goal. Silva strayed to the middle all the way from the right, Dzeko moved to the left and Nasri made a short diagonal to the middle, leaving the opposition’s defense stranded, not knowing who to mark – and suddenly, there was a huge avenue right down the middle. Even though City’s second goal came from a corner, the most important aspect is the play that led to it. Silva drifted once again to the left to overload that side and was only stopped by a last-minute ditch, revealing the growing difficulties Spurs were having to know who to mark – especially with Parker often being dragged out of position. When it seemed City were in total control, Savic threw it all away two minutes later, allowing Spurs back in the game with a disastrous headed approach that left Defoe free to go around Joe Hart (who also had a terrible approach, incidentally) and score. A few minutes later, Bale equalized with a great goal, revealing a curious tendency: out of the 5 goals, 3 were the direct result of a winger pulling inside. 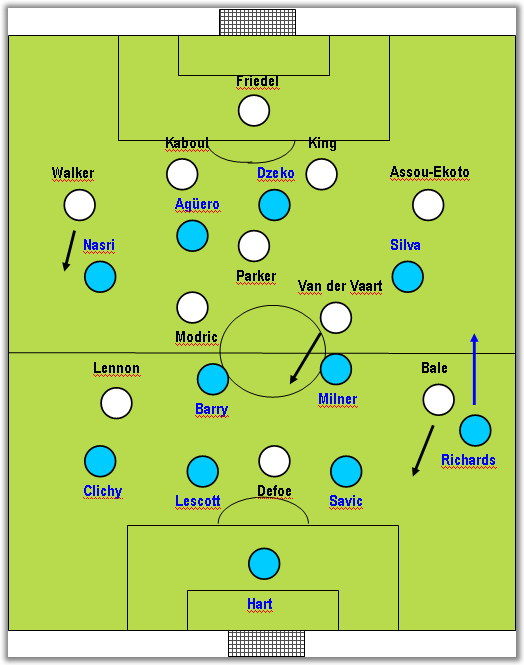 After that, Silva and Nasri started tiring out, meaning they were not as willing to track back, and Tottenham started pushing men forward, especially after Livermore came in for van der Vaart and brought more stability to the midfield. In fact, the penalty that gave City the victory came 30 seconds before the 5 minutes of injury time were up and Spurs had actually had the best chance to finish the game just a few minutes earlier. In conclusion, City dominated most of the game, deserved the lead, but were not able to put the game out of reach. Spurs were very fortunate with the timing of their first goal and their conservative approach could have brought heavy consequences once again at the hands of Mancini’s team. The Italian, in turn, will surely be missing Kompany’s skills and leadership.